Lianne and Ashley were married in December 2018 at The Manor House Hotel in Moreton on the Marsh. The day had been planned meticulously, right down to the wedding wellies that sat next to the dress when I arrived in the morning, however, luckily these were not to be needed. I knew from the moment I met Lianne and Ashley that their wedding was going to be a special day and they it did not disappoint. They and their families and friends made me feel very welcome and it was very clear to see how much love there is was for both the Bride and Groom. 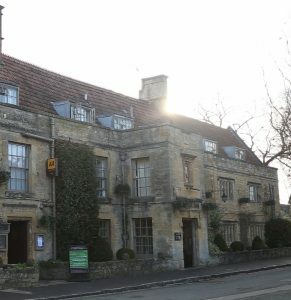 It was the first time I had filmed at the Manor House Hotel, I had driven past it many times but never been in. I expected it to be full of character, however I was pleasantly surprised by the space within and also the beautifully manicured walled gardens at the rear. I went to see the bride and groom separately, the bride and her bridesmaids were very calm and relaxed where as panic had set in with the boys as they frantically scoured Youtube for “how to tie a double Windsor knot”. The Ceremony was very emotional so once the formalities were done everyone needed a breath of fresh air. Just enough time for Oli and Jane at Cotswold Weddings to get the group shots done and then some informal fun shots of the groomsmen and the bridesmaids. Once these were done we let everyone go back in doors whilst we took Lianne and Ashley off to get some footage of them walking, talking and canoodling in those beautiful walled gardens. Luckily the last of the winter sun shone so we managed to get some great backlit shots of them that looked amazing. Once we’d finished the portrait shoot thebride and groom went back to socialise with their guests whilst we popped into the wedding breakfast room to get some detail shots of the room, tables and their amazing cake before they entered. 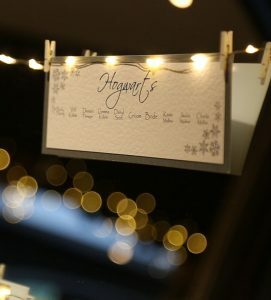 The tables had been named after places within the Harry Potter story with the head table being hogwarts and the Leaky Couldron and Diagon Ally just a couple of the table names. The speeches were perfect, full of fun, ribbing, advice, emotion, stories, but above all affection for the newly married couple. Before the eveing guests began to arrive we managed to sneak the bride and groom and a few guests off for a sparkler shot and then a few shots with the ambient light in the back gardens as a backdrop to make for some great night shots. Once this was done it was time to let the guests let their hair down and get some action shots.